Sometimes you just don't have time. 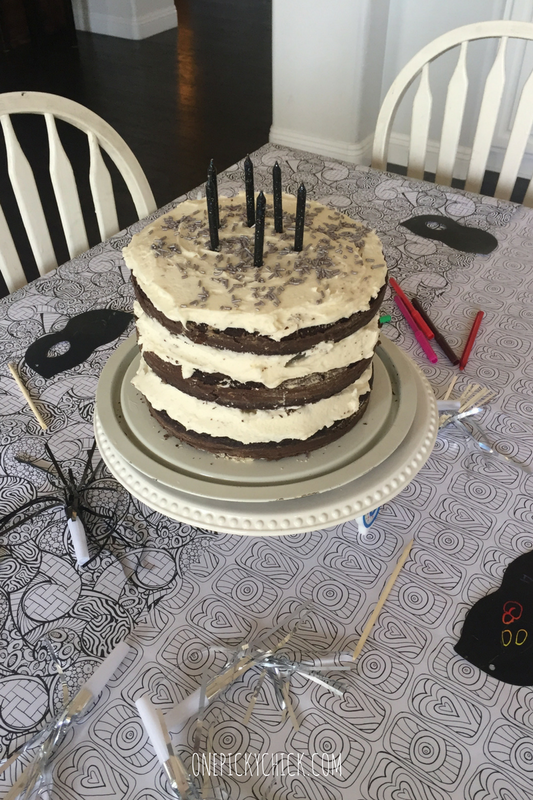 So do a QUICK SIX (birthday party)! I love planning parties. 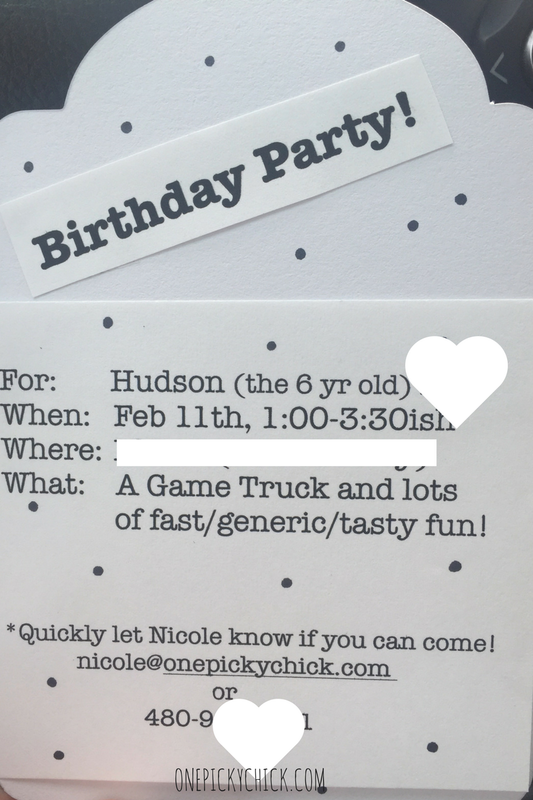 Kids birthday parties have long been one of my favs. Your kids are only young once. You get one shot of making those memories light up the rest of their lives. Maybe yours too! But let's be honest. Life is busy. We got things going on... we can't aways spend hours on party plans. Like the "Police Birthday Party or the "Savvy-Chic" Birthday Party I pulled off a few years ago. Those took some time. 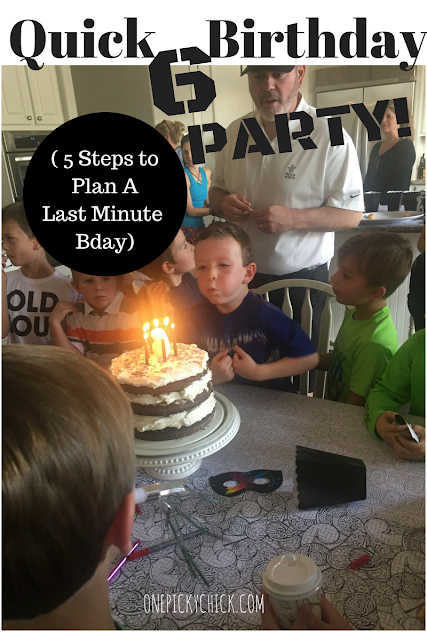 This year, when my son's birthday party rolled around I was less than enthusiastic. I was worn out from busy holidays, sports seasons, work and family! So I decided to do something that took little time. And guess what? It turned out great. Kids happy. People fed. Love spread. Memories made. And embrace it. My son LOVES football. To date, he's now made AND thrown a Pick 6 (interception, followed by a touchdown, for those of you who, like me, knew not). It's all he talks about! So, I decided, rather than a Pick 6 - let's do a QUICK 6 Birthday party. Yes, he was turning 6 years old. It would be a generic, "thrown together," fast party! Yes, I made the invites. That's my own hang up. But I will say, as I always do... it does set the tone. 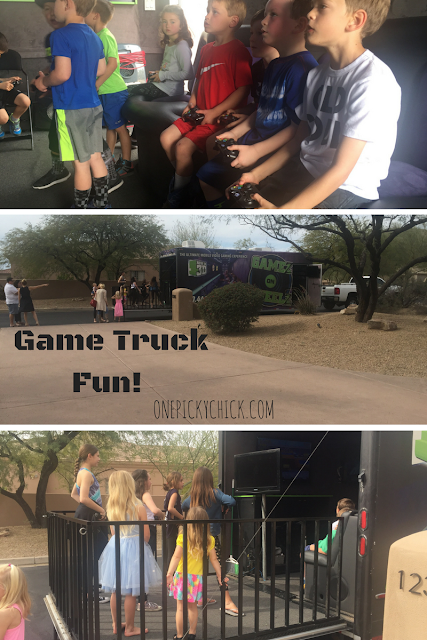 It was time to call in a game truck! I found a company to come in, for 2 hours, and the kids LOVED IT! There were video games and dancing video games. Room for like 22 kids (plus). It not only made them happy - but me too. It was the main source of fun. It cost about $300, so it's not cheap. But worth every penny! Sometimes you think of the theme and find stuff to go with that. Other times, you make a theme around what you find. In a last minute party that can easily happen. At which point, number 1 switches with number 3. Does that make sense? Hopefully. Here - while I had a basic theme idea in my head - I wasn't sure how I was going to pull it off. So, I went to Michael's. 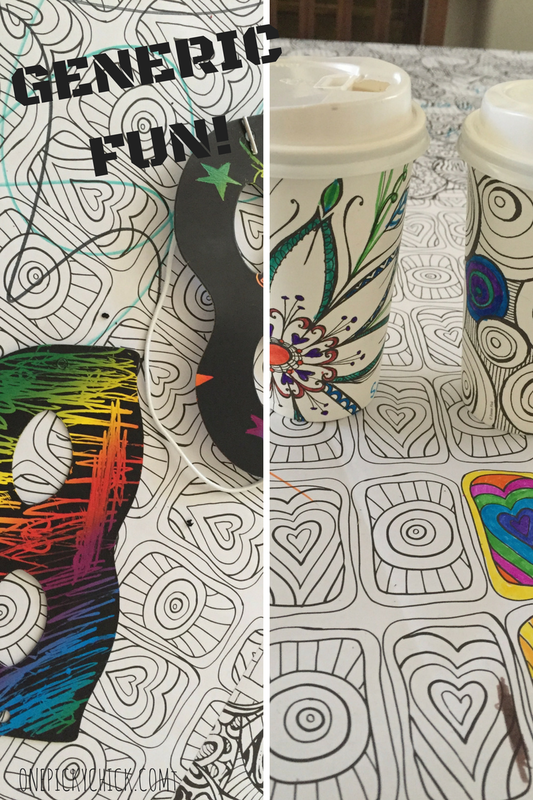 I saw some black and white cups and wrapping paper, both, you could color (below). I also grabbed black and white serving items and black masks that scratch off to make designs. 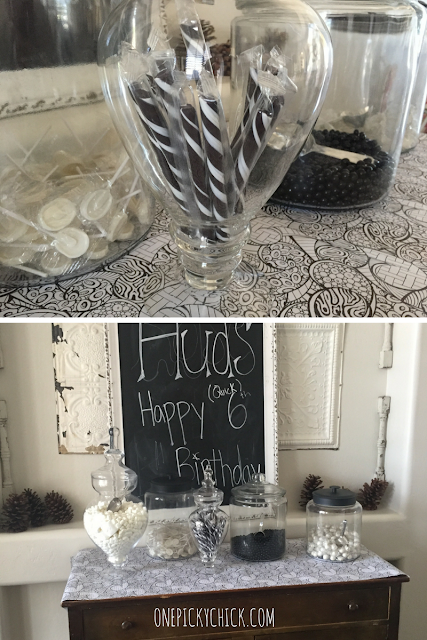 Plus some B/W favors and the party was planned in minutes. I used that wrapping paper to cover all table surfaces. 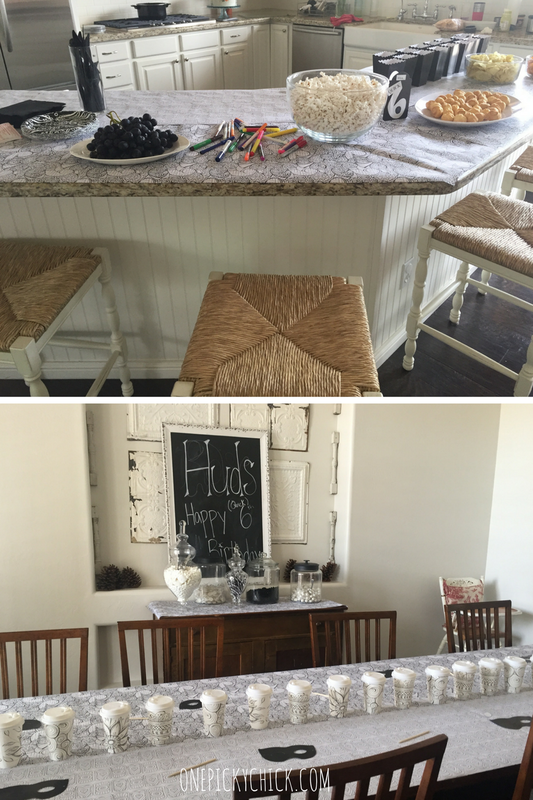 The main table, the cake table, the candy buffet and even my kitchen Island. Then I threw markers and pencils around so kids could color anywhere! I chose as many black and white food options as I could find! Black (dark purple) grapes, white popcorn, hot chocolate & marshmallows (which they were supposed to drink from their b/w cup they colored), white creme puffs... white bread sandwiches & a dark juice drink (not pictured) you get the drift. Then of course that candy bar (which doubled as add ins to the take away bag)! The cake... I made myself and not only decided to do black and white but gave it a sort of undone look... which was supposed to look like I did it fast but it also happens to be really chic right now! Finally tonight, even with the game truck and the coloring options, you need something else for kids to do. Options at a party - are good! 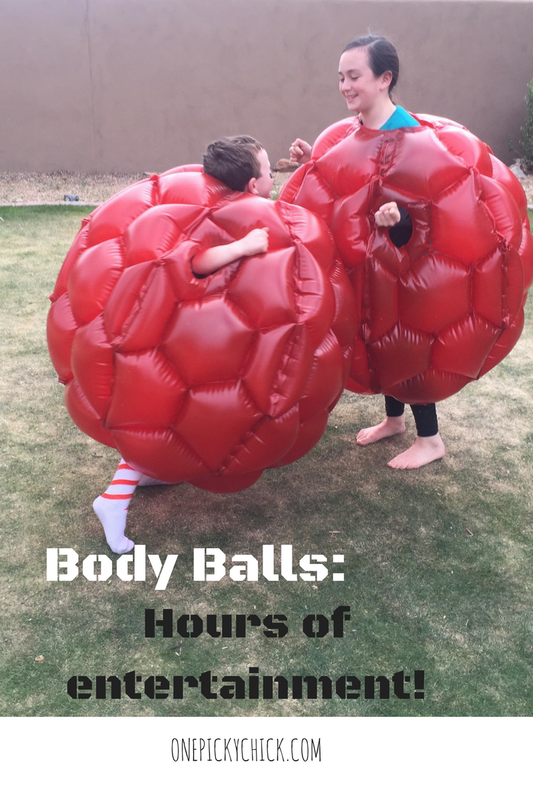 So, the kids had a blast with our extra last minute addition which were these body bumper things. 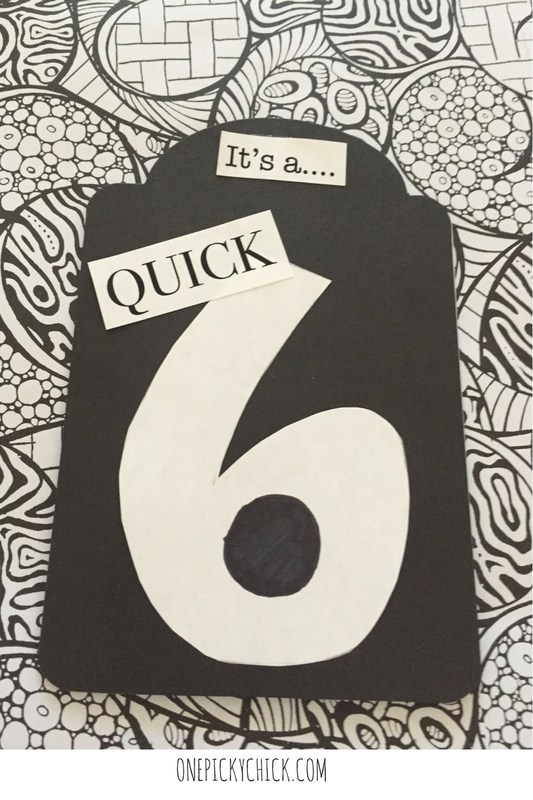 A random, non-themed, fun activity which really worked! Sometimes, it's the little things! Not much work, last minute and generic... yet , a "Quick 6 Birthday Party" was born. We all loved it. And now you can too! 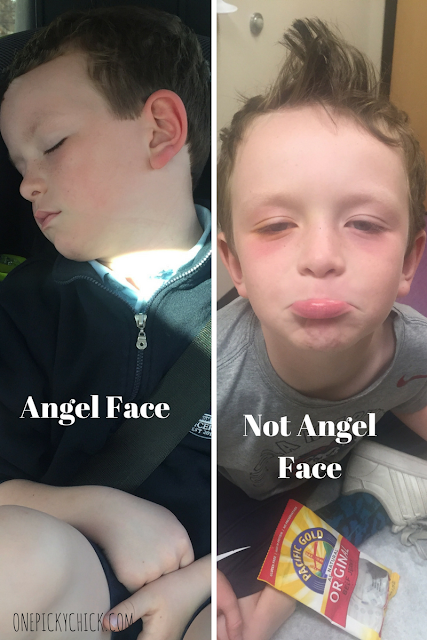 Have you ever had a Bad Mom Moment? Maybe there's no such thing. Warning: the contents of this post may offend someone. I am sorry for that in advance. But you don't have to read it. It happens to everyone. We all have Bad Mom moments. Heck, they even made a movie about the subject. It's more acceptable now. To make mistakes. To get it wrong. It happened to me recently. I got something really wrong. I'm not proud of it. I'm actually really embarrassed. But my Bad Mom Moment worked. My son, who was on the receiving end of my "badness..." changed his behavior. Which made me think, I wonder if all the Bad Mom Moments actually equal good life learning for our kids. Wouldn't that be nice? It would kind of mean Bad Mom Moments aren't really that bad after all. My son is pretty well behaved. When he's at school. An event. Or someone's house. He's good for coaches, friends, other people in general. He is not, however, always good for me. Recently, I had a really busy day. It was a day, quite frankly, where I felt like I was losing my mind. I know you've been there. Plus, I had a headache, had no idea what was for dinner and we had to get to an Art Walk at school. Something I really didn't want to do. Nor did my daughter. But we were going anyways. Because my son wanted to see his master piece. As I was trying to round everything up to head out my little 6 year old man was barking orders at me. "We need to hurry, I want a snack, let's go - I want to play!" There were incessant demands that were very rude. And because of my head space at the moment I completely lost my marbles. Dare I say, it felt good? Not cool, I know... but good. For 5 seconds. During which time there was complete silence. He was in shock. I was in shock. I rarely say bad words and I certainly have never told my children to shut up. But in that moment it was the best word(s) to use and exactly how I felt. 5 seconds of silence quickly turned to 30 seconds of "that's mean, you can't say that to your child, that's a bad word, you've never loved me... you would never say that to me if you loved me!" Of course I felt 2 inches tall. He was sent to his room to cool off as I reminded him I have always loved him and say that at least 5 times a day, everyday! Afterwards, once cooler minds prevailed, I explained to him that if he speaks to me horribly - I will speak to him horribly right back. It doesn't feel good for anyone. Including Moms. So here's the thing: since then he hasn't spoken poorly to me. Not really. Not beyond his usually whiny-ness at least. It's as if the SHHHHHHUUUUUUUUUUT--UUUUUUUUUUUUUUP worked!? I'm not sure why. I'm guessing it has to do with the fact that I did something so unexpected that it made a huge impact. 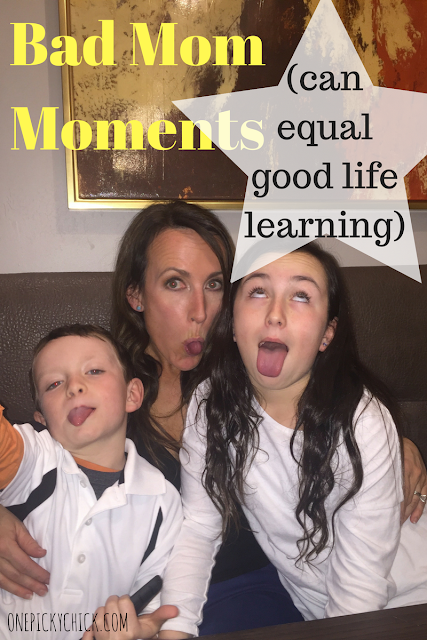 It was a Bad Mom Moment that may have turned into a good life lesson.